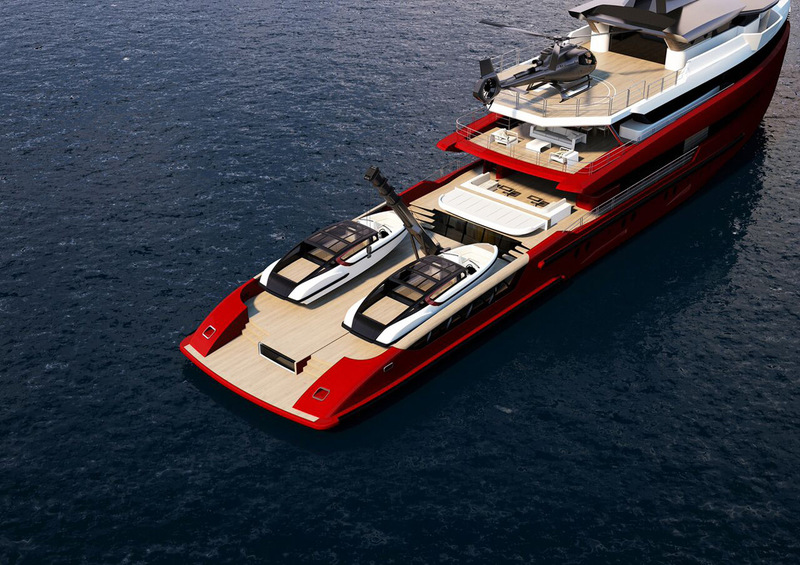 Columbus Yachts, is proud to unveil Tomahawk 52 m – the new explorer concept in its 499GT version. The vessel has a very unique Italian design. Marco Casali has based the concept of the new explorer on Palumbo’s shipbuilding experience and heritage. The Columbus Tomahawk is conceived as a ship for its technical and seakeeping qualities, not just as a yacht. The hull (by Insenaval) is the result of a research vessel experience, designed to offer the best sea keeping and stability qualities in any weather condition worldwide. The name “Tomahawk” – which comes from a North American Indian battle axe – gives the bow its unique design: created for a perfect relationship with the sea, it recalls the power and the stylish design of the ancient and solid weapon. The clean-cut design of this explorer vessel perfectly combines with the extraordinary spaces for guests, with high quality finishing and unique comfort, offered by the incredible size and ”smart” layout. 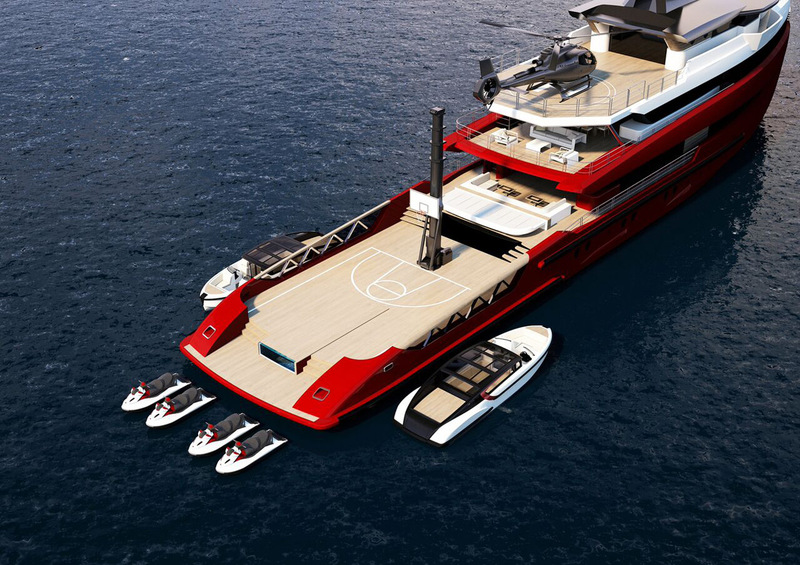 The Tomahawk is a concept that may be developed in lengths from 40 to 100 m: a full custom design which is able to satisfy the owner’s wishes on an unbeatable technical platform. The vessel’s extra-large volumes are clearly devoted to the largest beach area ever (200smq on 3 levels) and all kinds of sea-toy storage. 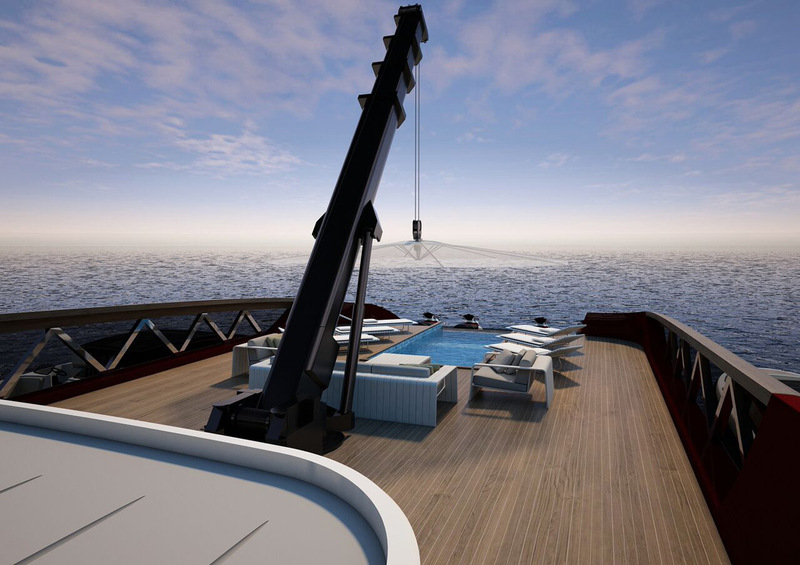 The aft level opens directly over the sea with the possibility of hosting up to two 12m tenders. Four jet skis, a submarine or several motorcycles could be hosted in the lower garage together with inflatables or other toys. A bow garage guarantees space for an additional tenders and sea-toys. When empty, the entire area reveals the full size swimming pool (6×2.5 m) in a space that could host three quarters of a basketball court (9x7m). This area may be equipped with free standing tables, sun bathing platforms or settees, or as a big playground. The powerful crane for tenders and submarines can also be used as the lift for an ample canvas bimini to provide shade for the beach area. Among the unique features of this vessel, is the opportunity of hosting an MCA compliant helipad on the top deck with direct access to the main stairwell, along with an enlarged bridge offering perfect visibility for mooring and cruising in any location.